The fall chess program starts at the Millburn Library on the 2nd floor October 2 and continues every Saturday until December 18. Kenilworth Chess Club members National Master Scott Massey and Mike Wojcio will be teaching the classes again. The classes run from 1PM to 2:15PM for beginners, from 2:20PM to 3:15PM for intermediates, and from 3:20PM to 4:55PM for the advanced players. The students will be taught the rules of chess, sportsmanship, tactics, strategy, and chess notation. NM Scott Massey and Mike Wojcio will also go over games and certain positions to teach the children. All children from 5 yrs. to 16 yrs. are invited to attend these classes. When students become more serious, there are tournaments like the 31st Millburn Library Chess Tournament on February 12th 2011 and the US Amateur Team every February. The cost is $20 per class. Please make the checks made out to the "Friends of the Millburn Library". For more information, please comment here or contact Mike Wojcio in email listed in comments. "We came to an agreement that Vladimir plays wussy chess..."
On the other boards, Morozevich outfoxed Svidler in an offbeat variation of the Scotch Game, bringing himself into the pack chasing the leaders. If you haven't noticed yet, USCF added a few more bits of information about their members. Search for yourself. After you find yourself, the first screen will have your general information. Mine looks like this. Notice the "Show Game Statistics" link. It has a record of your wins, losses, and draws vs your opponents broken down by their rating. Note in my game statistics, I have 151 games total. 70W 19D and 62L. Ian (aka "I offer you a draw”) has 160 total games. 37 of which are draws. Ahh, this reminded me of our time at the Amateur Team East tournament two years ago when our team- Ian, Mike's friend, Mike, and myself, needed the full point to fight for U1900 prize. We all know what happened! I offer you a draw. After a slightly disappointing start, Anand faced one of his most dangerous opponents, Levon Aronian. 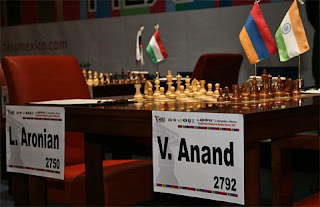 The Armenian grandmaster is one of a very few players who seem to have Anand's number, with a healthy winning ratio against him. Moreover, Levon never backs down from a fight. The result? Informator's game of the year, and the subject of a 12-page analysis in a recent book called "Modern Chess Classics". 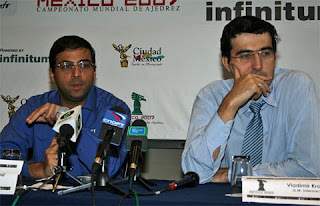 It's been three years since Vishy Anand started his reign as undisputed world champion. 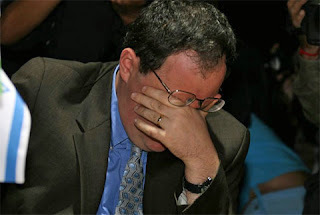 His journey that is remarkable in retrospect, since to earn his years at the top required not only beating his two premier generational rivals (Kramnik, Topalov) in matches, but also winning one of the more difficult tournaments since AVRO 1938. 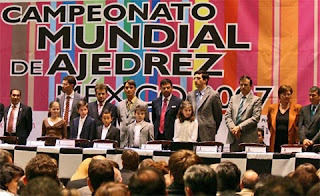 The world championship tournament held in Mexico City in 2007 brought together eight of the strongest players in the world including then-champion Kramnik, as well as Gelfand, Leko, Svidler, Morozevich, Grischuk and Aronian. The eight players would then play a double round robin (14 rounds) with the winner becoming world champion, and in the event that winner was not Kramnik he would have the right to a match against the winner. Julian Simpole, Steve Giddins and Raymond Keene managed to pull of the tournament book four days after 'Mexico 2007' was finished! Grandmaster Ray Keene was, perhaps, the first see the oppotunities created by computer technology in chess publishing. Formerly players had to wait months, even years, to see a tournament book. Computers revolutionised publishing and made it possible to telescope the entire process into a few days. Keene invented the 'instant book' and this effort is perhaps the most spectacular of all his achievements. To make up for this glaring gap in the literature, this struggling class A player will do what even Ray Keene could not, and provide the most worthless account of the world championship yet written. 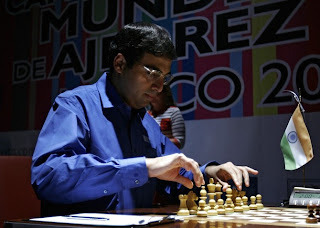 Over the next two months we'll take a look at all of Anand's games from this event, win, lose or draw. "For this move, Ziggy will be ok if he stays on a black square." Of course, Newenglandah means Ziggy will be ok if he goes on a light square. 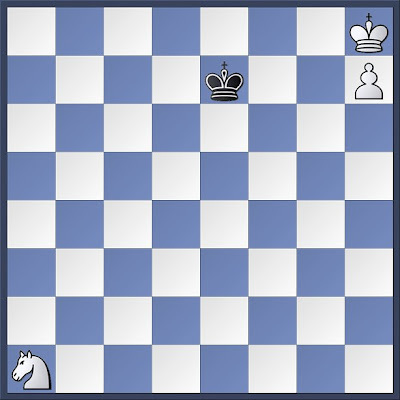 On White's next move, the knight can move to a light square only attacking the dark squares. So Ziggy is safe on light! An important feature to remember when looking at this similar position below.